In another article, we explain direct objects. They're the noun or noun phrase that receives the action of the verb. They answer the question of "who" or "what" is receiving the action of the verb. For example, "Marie brought cupcakes and iced tea." Marie brought what? Cupcakes and iced tea. So, where do indirect objects fit into the equation? Truth is, they're far less prevalent than direct objects, but they do serve a purpose. They're the receivers of the direct object. That just got confusing, didn't it? Fear not! The indirect objects examples below will make everything clear. "James built Marie a tiny house on the beach." In this example, "James" is the subject. "Built" is the verb. James built what? (Don't be tempted to think the direct object is Marie. James didn't build Marie.) He built a tiny house. This is where indirect objects come in. Who's receiving the tiny house? Marie is. Becky baked Bernice a plateful of cookies. Her mom brought her a glassful of seashells. In art class, I made my roommate a sculpture. Marcia gave her sister a sidelong stare. Can we tell our friends the story of how we met? The sun gave the garden a pocketful of sunshine. Seamus assembled Marie a brand new office chair. His dad offered him his '69 Chevelle for his 30th birthday. During the snowstorm, I wrote my brother a heartfelt letter. Michelle gave Caleb the night's homework assignment. Let's bring Mom and Dad the manuscript of our first play. The moon offered the ship an opportunity to find the way home. Alan finally gave her the engagement ring. She gave her dog a bath before they went away on vacation. Early the morning, I baked Bryan cupcakes to take to class. For an indirect object to exist, there must be a direct object. Direct objects only associate with transitive verbs. The definition of a transitive verb is an action verb that works with direct objects. So, they're one big happy family. Indirect and direct objects will never follow linking verbs. These verbs do not show any action. Rather, their sole function is to link the subject of the sentence to further information. That further information is known as the subject complement. Notice none of these words convey any sort of action. That is where subject complements differ from direct objects - in the verb they're following. However, there is a common denominator. Subject complements also answer the question "who" or "what." Simply put, what you have to keep an eye out for is the verb in the sentence. Subject complements work hand in hand with linking verbs, while direct objects work hand in hand with transitive, or action, verbs. This is important because you never want to confuse indirect and direct objects for subject complements. Let's look at three examples to illustrate this difference. I was sad throughout the holiday season. I have been happy for months now. The apartment seems colorful, light, and airy. Indirect and direct objects provide added detail to our sentences. More than that, direct objects are required for many sentences to be complete. Indirect objects, however, are not. Remember Becky and her cookies? In one of our examples above, we said, "Becky baked Bernice a plateful of cookies." We need the direct object, the "plateful of cookies," to finish the thought. 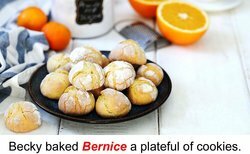 But, we don't necessarily need to specify they were for Bernice. It's an added detail that may or may not be important. "Becky baked a plateful of cookies" makes perfect logical sense on its own. Interesting, right? Understanding the parts of a sentence will ensure you're crafting cohesive and accurate thoughts. The best way to solidify your skills is to become a pro at diagramming sentences. It's a fun way to deconstruct the words that flow from our hearts. "Indirect Object Examples." YourDictionary, n.d. Web. 23 April 2019. <https://examples.yourdictionary.com/indirect-object-examples.html>. In another article, we explain direct objects. They’re the noun or noun phrase that receives the action of the verb. They answer the question of “who” or “what” is receiving the action of the verb. For example, “Marie brought cupcakes and iced tea.” Marie brought what? Cupcakes and iced tea.So, where do indirect objects fit into the equation? Truth is, they’re far less prevalent than direct objects, but they do serve a purpose. They’re the receivers of the direct object.That just got confusing, didn’t it? Fear not! The indirect objects examples below will make everything clear.